Carmen is an opera that involves seduction, passion, infidelity, jealousy and murder. 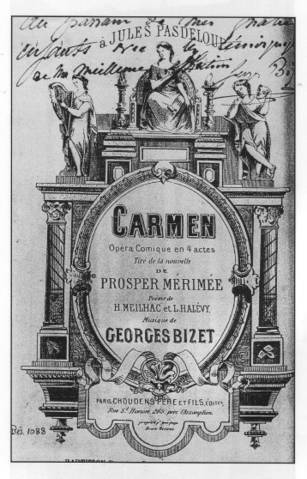 It was first performed at the Opéra-Comique in Paris on 3 March 1875. It was considered quite scandalous for its time, and the reviews and audience reactions were far from positive. In fact, the opera was more popular overseas. and it wasn't revived in Paris until 1883, eight years after its initial release. 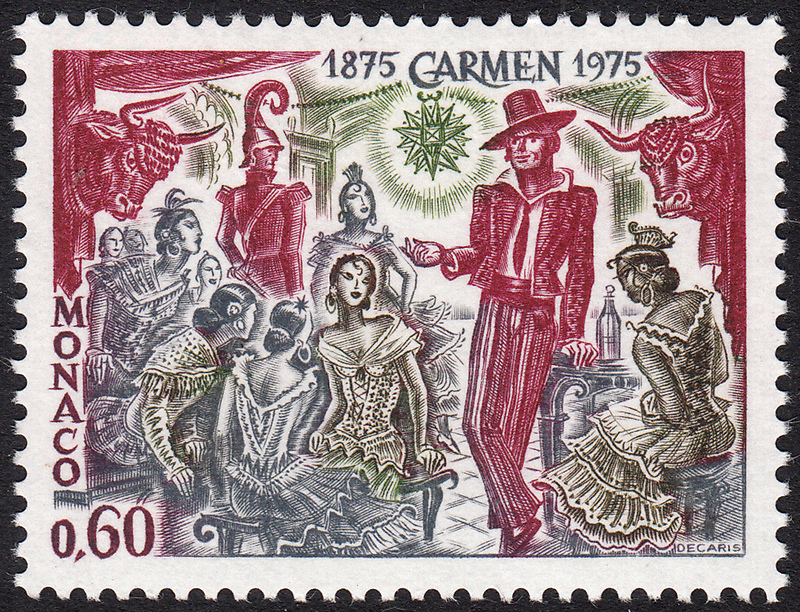 On 13 May 1975 Monaco issued a set of four stamps to celebrate the 100th anniversary of the premiere of the opera, Carmen. This beautiful set of stamps was designed and engraved by Albert Decaris. Each stamp represents one of the four Acts of the opera. In last week's blog we were introduced to Carmen with an in-depth look at Act I and the first stamp in the set. Click HERE to read about Act I. The lights come on. We are in an Inn owned by Lillas Pastia, in Seville, Spain c.1820. Two months have elapsed since the events of Act I.
Carmen is partying at the Inn with some friends and entertaining the soldiers present. One of the soldiers is Zuniga, the officer who arrested Carmen in Act I for wielding the knife. He approaches Carmen and tells her that José has just been released from his two month imprisonment for letting her go. She is delighted at this news! Probably because she starts thinking how she can further manipulate the poor guy. Suddenly there is noise outside as a procession approaches, announcing the arrival of the toreador, Escamillo. Toreador's were like rock-stars back then. Escamillo enters and announces himself with the "Toreador Song". He grabs a drink and makes a toast: Votre toast, je peux vous le rendre! Then he sees Carmen and makes a beeline for her. But Carmen ignores him. Then the owner of the Inn, Lillas Pastia, gets rid of the crowds and the soldiers. Only Carmen and her two friends remain. They are chatting, when two shady-looking characters enter. These guys are smugglers. They tell Carmen and her friends that they want to get rid of some contraband they just got their hands on. Carmen isn't interested, but her two friends are. Carmen is only interested in seeing José again. The smugglers give up and leave. A short time later, José turns up. Carmen immediately launches into a private exotic dance just for him. Je vais danser en votre honneur (I will dance in your honour). But Carmen's intimate dance is rudely interrupted by the bugle call from the soldier barracks. 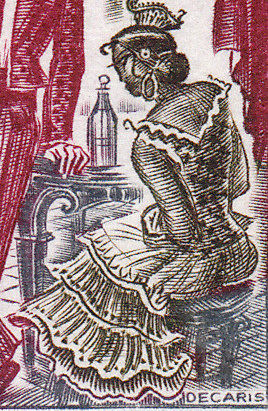 José turns to leave, which angers Carmen. She obviously thinks he doesn't really like her after all. But José produces the rose that Carmen had thrown at his feet in Act I. This romantic act is seemingly not enough to impress Carmen. She mocks him, and tells him that the only way she will possibly believe him is if he runs away with her, abandoning his military post. José flatly refuses. He doesn't want to desert. Now it is time to reveal the stamp for Act II. This lovely stamp, with its sumptuous use of deep red, draws us into the Inn of Lillas Pastia. 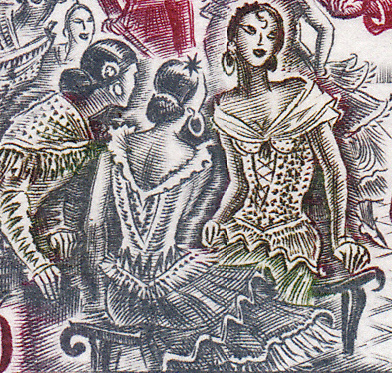 The main focus of the design is Escamillo, the toreador, singing to Carmen and her friends. He is in red. Decaris has placed bull heads in the top corners of the design to remind us of Escamillo's bull-fighting prowess. These are also in red. In the background to the left we see another figure in red. This is José. Lurking, waiting to enter the scene. Much like the toreador was lurking off to the side in the first stamp. Decaris' use of red to highlight the central themes of the Act is a stroke of genius. The attention to detail in this stamp is incredible. Especially striking are the women's costumes. Oui, c'est très belle! J'adore les couleurs merveilleux ! !